Well, first things first, your character needs to be the sneaky sort. They need to have a full repertoire of skills at their disposal that allows them to remain unseen. There needs to be plenty of opportunities for creativity, plenty of available choices, and a number of factors which contribute to (or detract from) one’s stealth. Enemies should be dangerous yet believable, intelligent yet predictable. Most importantly – and this is where so many titles fall short – the game needs to make the player feel empowered, while at the same time making things hazardous enough that stealth really is the best option. Klei Entertainment’s Mark of the Ninja manages all these factors with flying colors, and looks damned fine doing so, to boot. 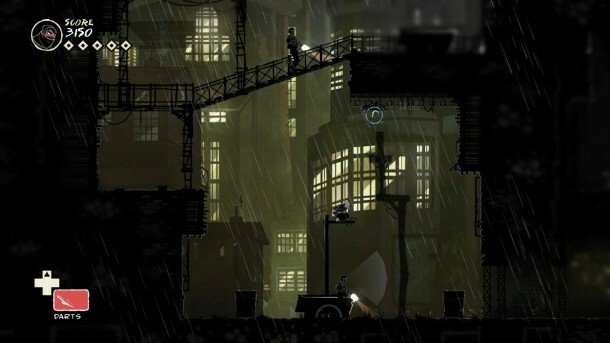 Perhaps even more impressive is that it does all this as a 2D platformer. That platformer, far from being simple, is remarkably deep: more so than many larger titles. In Mark of the Ninja, players take on the role of a nameless ninja sporting a host of mystic tattoos. This ninja is the champion of the Hisomu clan; the tattoos grant him superhuman abilities, albeit at a terrible cost: he will inevitably be driven insane by their influence. This marked champion is dispatched to kill a businessman by the name of Karajan after a cadre of mercenaries hired by the mogul descend upon Hisomu temple. Along the way, he’ll be forced to use a whole host of archaic weapons to counter the modern gear wielded by his foes, including bamboo darts, spike traps, and smoke bombs. All of this equipment is, not surprisingly, devastatingly effective in the hands of the champion. In-game, stealth is impacted by both light and sound. Running makes noise, and will very likely alert someone to your presence, while staying in the light cast by a lamp or by a guard’s flashlight is guaranteed to lead to detection. Consequently, sticking to the shadows and taking your time will allow you to remain hidden. Of course, this can all be used to your advantage, as well. Making noise of any sort (for example, throwing a bamboo dart at a nearby gong) will distract your foes and potentially cause them to investigate, while most light sources can be destroyed, bathing an area in darkness. This system is made even more complex by the fact that, occasionally, if you manage to kill one guard undetected while he’s in sight of others, they’re very likely to panic and make your job even easier. It gets better: in most cases, you actually have a choice as to whether or not you want to kill. It’s actually possible to play through most of the game without having to slaughter a single guard. What’s more, you’re given a considerable degree of freedom in how you want to approach a given situation; most levels feature multiple paths and the option for a wide array of tactics. In the event that you’d prefer to kill, you’d best be cautious- bungling a stealth kill will give your target a messy, gurgling demise which is likely or alert anyone nearby. A ninja’s job, the game reminds you, is about skill and finesse. Bodies can be hidden after a guard is done away with, or left out in the open. Your choice- just make sure no one stumbles onto them if they aren’t hidden. Oh, you can also slow time, and climb on walls and ceilings. Supernatural tattoos, remember? As a stealth game, Mark of the Ninja is, quite frankly, remarkable, and as an action-platformer, it manages to be cut above its peers. The fluid animations and incredibly fine-tuned controls make for an enjoyable, altogether empowering experience; well-animated cutscenes tie everything together and add a nice dose of context to each mission. If you’ve not yet picked up this one on Steam, do so. You won’t regret that choice.